A fiery encounter at the Memorial Ground saw Shrewsbury Town leave Bristol with a point in a key relegation clash. Shaun Whalley marked his first league start in 2019 with the opener before the break. But Shrewsbury were undone again by a former player. Last Week James Collins came back to haunt his former club by netting and a brace, and another old Town man in the shape of Alex Rodman was on target for the hosts in this one. Dave Edwards has only recently returned from a groin injury, but he is set to be suspended for the next three games, after being shown a straight red card. Sam Ricketts made a host of changes from the side that lost 3-2 against Wolves. Mat Sadler and Anthony Grant returned from suspension, whilst Ro Shaun Williams, and Scott Golbourne were drafted in. Neither side made in-roads during the opening 10 minutes, but Shrewsbury looked a threat on the break. The home outfit had the game’s first chance of note. Alex Rodman found Liam Sercombe at the back stick, but the former Oxford United midfielder was denied by quick reactions from Steve Arnold. At the other end, Josh Laurent let fly from outside the box, but his strike didn’t trouble Brentford loanee Jack Bonham in the Rovers goal. Shrewsbury had a glorious chance to break the deadlock. However, Anthony Grant scuffed his shot from close range, when he should have at least hit the target. But Shrewsbury did take the lead with ten minutes of the half remaining. Josh Laurent and Shaun Whalley played a neat one-two, before the latter cut inside and saw his deflected effort find the back of the net. Former Shrewsbury defender Graham Coughlan responded to being a goal down, by sending on Clarke-Harris and Jakubiak. And the substitutions had the deserved impact, as Rovers drew level. Clarke-Harris won a free-kick and Chris Lines sent the delivery towards Alex Rodman, who powered header beyond Steve Arnold. Rovers continued to apply pressure. Liam Sercombe teed up former Charlton Athletic man Tareiq Holmes-Dennis. His whipped attempt was clawed away by Steve Arnold. Shrewsbury responded well to the flurry of Bristol Rovers opportunities. Substitute Greg Docherty was played through by Shaun Whalley. The Rangers loanee drilled his effort just wide of the target. The game ended 11 V 10; when Dave Edwards was sent off for clattering his opponent in the middle of the park. Town fans were incensed as a yellow card may have sufficed. The point sees Town move up to 22nd, whilst Bristol Rovers rise to 19th. 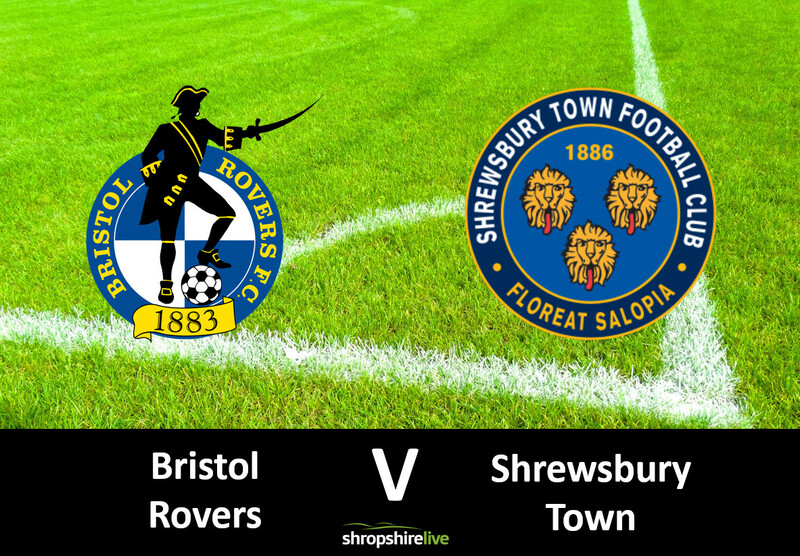 Shrewsbury welcome League Cup semi-finalists Burton Albion next Saturday, whilst Rovers visit Portsmouth on Tuesday night.